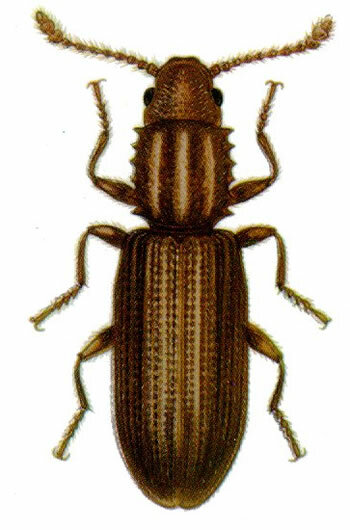 The saw toothed grain beetle is one of the easiest pests you will have to deal with but it is still a pest and there's nothing good about pests. . This reddish-brown critter has the ability to fit into unopened boxes, I mean brand new sealed ones, almost without any effort at all due to the fact that it is very slim. This means that you will have to opened the box and inspect it in the cleaning phase explained below. If you look at it closely you will notice the six projections on each side of its thorax, this will leave you in no doubt you have a saw toothed grain beetle infestation. Diet: Loves to eat things high in fat, like cereals, chocolate, macaroni, mixes, cookies, etc. As I said before, you ought to feel blessed this particular beetle is the one you have to deal with and not one of more horrible ones like the Powder Post Beetle. 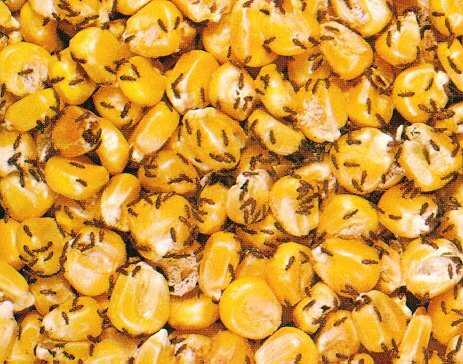 It is quite easy to get rid of the grain beetle, simply follow these steps and you'll not only prevent re-infestation of it but other bugs as well. 1. Locating the source. Once you find the source there's no use in saving salvaging it, get rid of it at once. Some of their favorite meals include, dried fruits, sugar based foods, cereals, cornmeal, cornstarch, rice and other grains, herbs, chocolate, oats, pastas, sugar, drugs (prescribed pills, etc. ), spices, candy, dried meats like beef jerky, popcorn, bread, nuts, crackers, dog and cat foods and of course flour. Inspect these first! 2. Cleaning Time. As always empty out your pantry cupboards and other food storage spaces. Clean thoroughly and with gusto, get your vacuum cleaner involved to make sure you get rid of all beetles as well as the larvae. Feel feel to disinfect your food storage in whichever way you'd like, this step is not really necessary but it is encouraged. 3. Inspect Unopened Boxes. Before you start restocking your pantry open up any new boxes and inspect for bugs. As said before, these little critters can fit into almost any new box. 4. Keep Your Home Cool. The eggs this beetle leaves behind start to hatch when the temperature reaches 80 degrees Fahrenheit, this is also true of other common pests and household bugs. The best solution for this problem is to keep your home below 80 degrees Fahrenheit and the humidity level below 15%, most of your headaches will disappear if you make your home's environment as unfavorable to pests as possible. I strongly discourage you from using any chemicals around your kitchen and food areas. 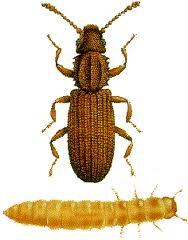 Plus the saw toothed beetle is so easy to control chemicals are not necessary at all.